Hello, my loves! This is probably my favorite time of the year, so I wanted to celebrate with a “Summer to Fall” Lookbook. Stylistically, I am the most inspired, and thus, creative, during this season for the following reasons: I love the weather – it’s not too hot nor is it too cold; I am able to layer, but I do not have to be bundled up; and everything smells like pumpkin, which puts me in a really good mood. This is definitely my favorite time of the year. If it wasn’t obvious, I have done a similar post before (Oh my, I was such a baby then! Please excuse the post – I, too, cringed while reading it again.). And fair warning, I will probably post a Fall Lookbook by the end of fall since this one emphasizes on the transition between the two seasons. 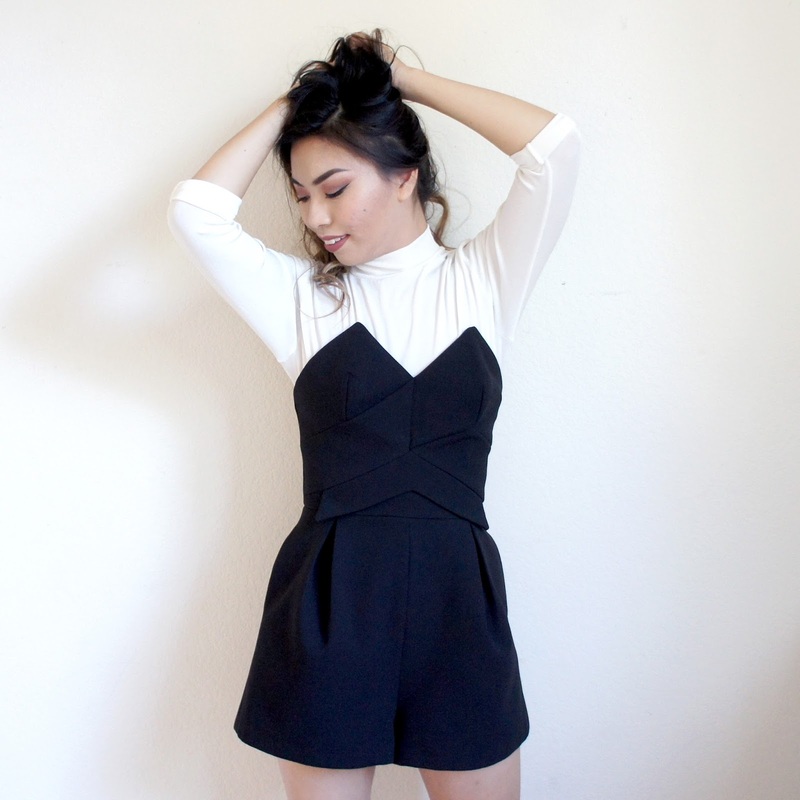 This beautifully structured playsuit has definitely been my summer fling – I wore it everywhere. Luckily for it, I see myself wearing it this fall simply by wearing a layer underneath. Here, I’m wearing a sheer turtleneck, but I can wear a basic T-shirt instead followed by a cardigan. Personally, I think layering creates a really sophisticated silhouette with the sweetheart neckline. For example, the wrinkles on the shirt reminds me of pleats, which make the playsuit look modest. On the contrary, the playsuit usually gives off a sultry vibe. I wear dresses almost on a daily basis. I think dresses are extremely flattering if you get acquainted with your body. They are easily dressed up and down. Lastly, their PPWs are always well-worth. This Forever 21 knitted dress is perfect for transitioning from summer to fall. The material isn’t too thick, so you can throw on a jacket if you feel a bit chilly. 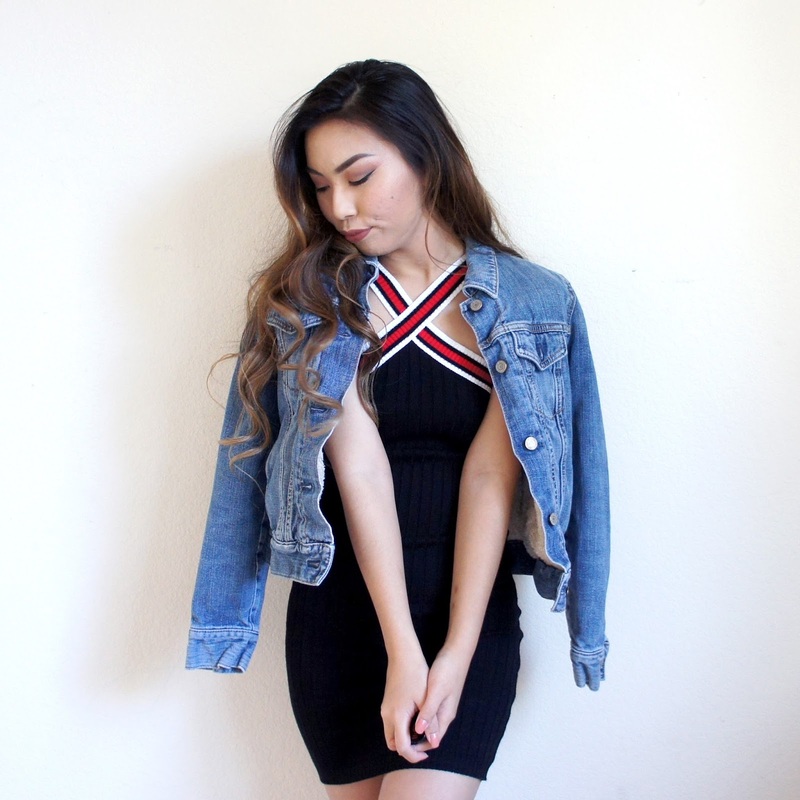 Denim jackets are a must for the fall (and winter). They can causal down a fancy outfit, but they can also make a basic outfit look put together. I recommend finding a denim jacket at a thrift store, especially in the men’s department. Denim jackets last for a very long time, so don’t worry about their wear – plus, any wear and tear adds to the jackets’ character. Crop top and short shorts – classic summer OOTD. Such combination does not need to be restricted to the summer. During the early transition, the weather feels more like summer than fall, so I still seize as much summer vibes as possible. In addition, I either wear a pleather jacket or an oversized denim jacket for warmth. Once the transition is over, I will substitute the distressed shorts for distressed jeans. I can still utilize the rest of the outfit. My Ten Cents #57: Take time to understand your body. Once you understand which pieces compliment your silhouette, you should wear them during any season.